Over the centuries many, if not most, words experience shifts in meaning. As generations go by some words get used in fewer situations, others in more, and the definitions gradually change slightly. But some words experience more seismic changes, their meanings getting wrenched out of all recognition. Here's one with a particularly convoluted development. The word entered English from French around 1290, with the meaning foolish, stupid. Within forty years it had added the meaning wanton, lascivious. A century later it was being used to mean strange or rare. 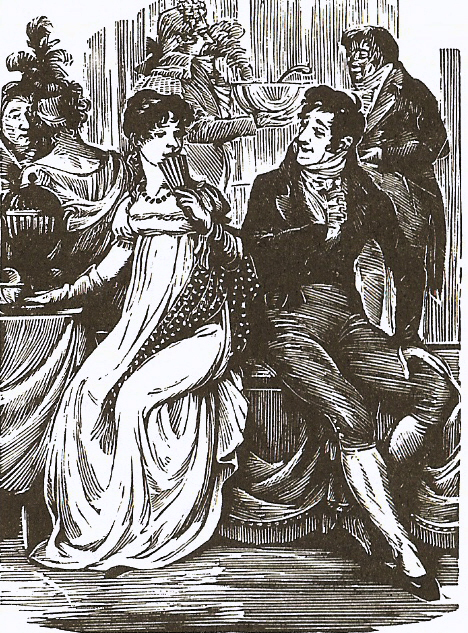 Connotations of extravagant dress seem to have led to a range of related meanings from effeminate to luxurious to delicate… And here's where things start to get really strange. We also get the meaning coy, shy in a word that had also been used for wanton and extravagant. By 1550 the word nice is being used to mean fastidious, dainty, both in the negative sense of picky and the positive sense of refined. 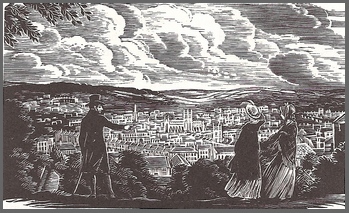 Along with that the word could mean precise, scrupulous, having or requiring great precision or accuracy… In the latter half of the eighteenth century the meaning generalizes to something like our modern sense of pleasing, agreeable, and in the first half of the nineteenth century we see kind. Already by Jane Austen's day the word had its current reputation of near-mean-inglessness, as seen in the following conversation from Northanger Abbey (c 1803). "Very true," said Henry, "and this is a very nice day, and we are taking a very nice walk; and you are two very nice young ladies. Oh! It is a very nice word indeed! It does for everything." From stupid to kind, from wanton to shy, from effeminate to precise and accurate, the word nice has done it all… and in its attempts to be all things to all people, has ended up meaning practically nothing. Here are a few more words that have undergone radical changes in definition. silly - Following a trajectory in some ways the opposite of nice, silly originally meant blessed, happy. The meaning moved from there to innocent, to harmless, to weak, to feeble-minded, foolish. The sense may have been altered by euphemism in the same way that the word special is gaining a similar secondary meaning today. Though sometimes strange, shifts in word meanings can be illuminating about the culture and attitudes of speakers. I worked all week on carving my wood block. To my dismay, I discovered a flaw in the wood. In a couple of spots something about the layers in the plywood wasn't adhered right, so that I would make a single cut and whole chunks of wood would flake off. The first couple of times it happened, I thought I'd messed up. The next couple of times I thought I was just unlucky. Then I realized what was going on, and that there was pretty much nothing I could do to stop the wood from flaking off. (You can see some of the areas in the first picture.) I tried gluing wood back on in a couple of places, but with limited success. I don't know whether the flaw was due to the age of the wood, or the fact that it was "student grade" quality, or what, but it was obviously pretty frustrating. So, here it is. Is it a complete disaster? Frankly, I can't tell. I know too much - too much about the details I carved that don't show at all, too much about the lines that were supposed to be bold and instead broke off completely, too much about how far this image is from my original vision. But then, I did know going into it that it was going to look rough and imprecise. So, is it an appealing, attractive image in its own right, without comparisons to what I was hoping for? I just can't see it with objective eyes yet. I'll have to come back and look at it again later and see whether I like it then. final state of half-timbered buildings (as yet untitled), wood block print by AEGN, 2012.
broadened my scope to something more accurately called "Creature Collections." And this time around I've found three creature collections that are really built around their illustrations, featuring the work of famous artists and illustrators. 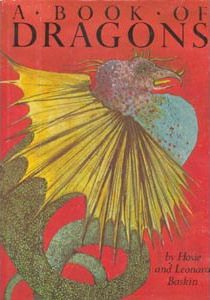 A Book of Dragons, Hosie and Leonard Baskin - This book presents twenty dragonoids, each with a page of text and a page of picture in Leonard Baskin's intense, inky style. 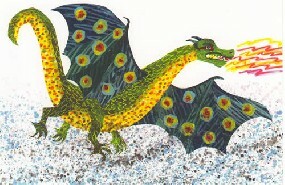 The creatures are pulled from various sources, from Tiamat to Smaug, with a couple of whimsical oddities such as the Fold-up Dragon. If you insist on traditional versions you might not appreciate Baskin's personal interpretation of some of these dragons, but I enjoyed them for variety's sake. creatures, each illustrated with Carle's bright collages. It includes a nice selection of beasts, and I plan to feature some of the poems in an upcoming post. Carle's depictions are more bold than mystical, but I think they generally capture the spirit well. But I did have one reservation: how do people feel about Ganesh included as a "creature that never was"? Is this different from including, say, ancient Egyptian animal-headed gods? Here Be Dragons: A Fantastic Bestiary, Ariane Delacampagne and Christian Delacampagne - Not a children's book, this is intended as a scholarly work on the symbolism, psychology, and cultural uses of fantastic beasts through history and around the world. I didn't even read the whole thing cover to cover. But I did look at all the pictures, and I enjoyed them thoroughly, too. Older children especially would probably find lots to interest them in this oversized volume with its beautiful photographs of works of art from a broad range of cultures. There are carvings, paintings, mosaics, pottery, textiles, and more, all showing fantastic beasts, divided up into five categories: unicorns, human-headed animals, animal-headed humans, flying quadrupeds, and dragons. 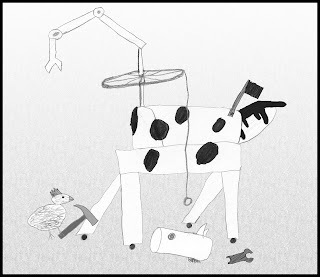 It's a beautiful tribute to the strange and marvelous workings of the human imagination. 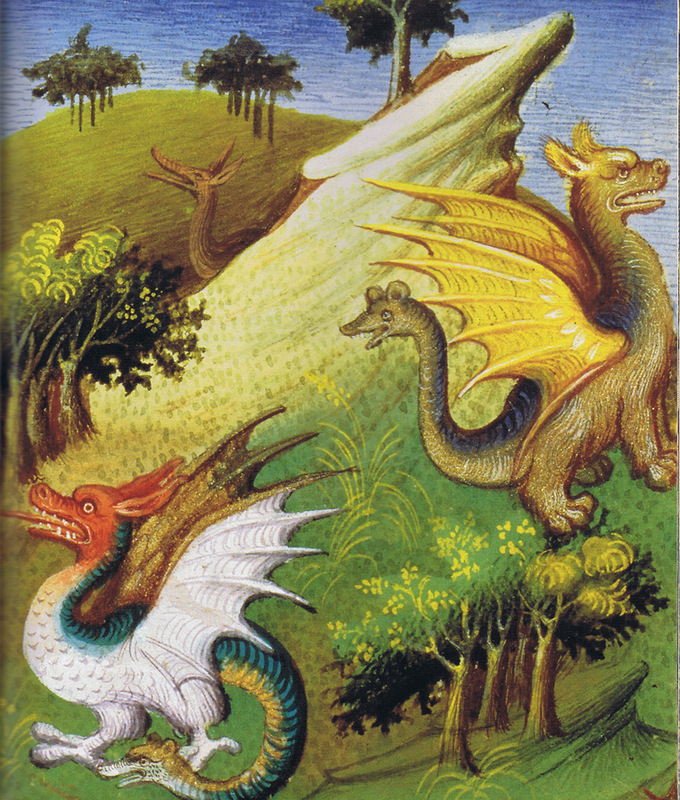 Do you know of any other fantastic bestiaries illustrated by noted or notable artists? If so, I'd love to hear about them. I know that my wood block prints will always be rougher and less controlled than rubber block prints, so I don't just pick wood or rubber randomly. I choose to use wood when I know that a rough, "carvier" look is what I want, as in animals with roughly patterned skins, or a scene in a more "primitive" style. My first instinct with a design like this would be to keep it controlled and clean by using rubber. But what about doing something a little different for once? I thought a scene of medieval or Tudor half-timbered houses would look cool if it were a little rougher, in keeping with the age, imperfection, and wear-and-tear of such old buildings. But of course until I get to the printing stage I really have no idea whether or not this will work. The first step is to draw the design, and since I don't like any of the ways to transfer a design to a wood block, I draw directly onto the wood. This new design is heavily based on photographs of several wonderful old buildings in Germany and England, but it's really a fantasy, my own fictionalized image of half-timbered architecture. Although there are lots of details, architecture is straight-forward enough to draw that it wasn't too hard to do it directly on the wood without excessive need for erasing. And the only thing I worried about reversing was my initials, since it doesn't really matter which way the buildings face. small shards of wood still hanging on. Furthermore, because carving wood is more physically demanding, I do it for shorter stretches at a time. So it could be quite a while before this block is ready to print. And only then will I see whether all this carving worked. All these little "mistakes" when too much or too little is cut away… will they give the piece a wonderfully natural, hand-crafted, antiquey-distressed look? Or will they simply ruin the whole blasted thing? Go ahead and throw out your copy of Cosmo, or Seventeen Magazine, or whatever. You don't need their dating advice any more. In honor of Valentine's Day I offer here a theory I discovered and tested while I was in college (a long time ago in a galaxy far far away). Although its power is profound, I must begin with the caveats. 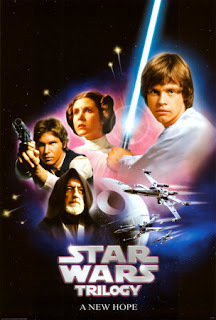 Subjects of the study have all been heterosexual females who were around 5-10 years of age at the time they first saw "Star Wars Episode IV: A New Hope." I have no idea whether the theory holds for any other demographic group. I would, however, be delighted to accept for future analysis any data you can provide. The basic premise of the theory is that women reveal what sort of men they're attracted to in their attitude towards the two main heroes of "Star Wars," -- but it's important to remember that it works only with girls who first saw the movie at the correct age. If you fall within this demographic, remember very carefully how you felt the first time you saw "Star Wars Episode IV." Whom did you prefer: Han Solo or Luke Skywalker? Think carefully, and be sure your answer represents your attitude at the time. 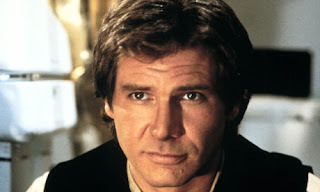 The vast majority of women prefer Han Solo when they get older, but that's irrelevant. If you had more of a crush on Artoo-Detoo or Obi Wan Kenobi than either of the others, that doesn't count, either. But if you distinctly remember loving either Luke or Han, then my "Star Wars" Theory of Attraction ™ can provide you with a valuable tool for analyzing your own dating habits. Let me explain how the "Star Wars" Effect works. When you see the movie at the right age, it isn't important that Han Solo has a sense of humor, or that he's Harrison Ford and gorgeous. It isn't important that Luke Skywalker is a teenager with a tendency to whine. All that matters is that Luke is a good, idealistic guy who's trying to do the right thing, while Han is an unpredictable, exciting adventurer. If you are a Han woman, you consider romance an adventure. You are attracted to "dangerous" and exciting men and reckless relationships. If you are a Luke woman, you go for genuinely nice guys and you want your relationships to be safe and comfortable. 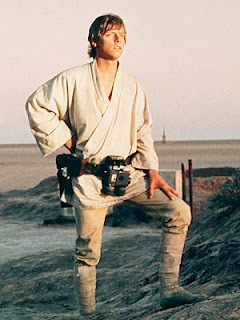 But perhaps you don't see the importance of knowing whether you're a Han woman or a Luke woman. Knowing what type you are can help you guard against the traps you're most likely to be caught in. A Han woman, if she isn't careful, sets herself up to be knocked down. In extreme cases a woman can think that being treated badly is part of the excitement of the relationship. A Han woman often thinks that she's the one who will tame the "dangerous" man she's chosen. Or even if she picks a man who seems nice enough, she may throw caution to the winds and conduct her relationship at a breakneck pace. Han women must guard against the illusion that bad is good. But don't despair. After all, Han Solo himself was a true hero, and there are men who are right and also exciting. A Luke woman isn't even attracted to a man unless she thinks he's basically a good guy. But there are plenty of men who are superficially nice but definitely the wrong man underneath. A Luke woman must guard against letting her desire for security lull her into relying too completely on her man. Her desire for stability may keep her working to maintain a relationship with a False Luke - a guy who said all the right things at first, but then begins to take you for granted or make you feel insecure or otherwise unhappy. But let your instincts for a good man guide you and you'll end up with a truly heroic Luke. So there it is, the "Star Wars" Theory of Attraction: Better Living through Sci Fi and Fantasy! Happy Valentine's Day! David Alfaro Siqueiros (1896-1974) was one of the major Mexican political artists, especially known for murals. I think political art requires a very tricky balancing act: to reveal injustice or social problems without being merely hateful and vicious, and simultaneously to express a clear message without being mere propaganda. That's why I seldom like political art regardless of whether or not I agree with its message - I just don't think it's usually very good art. 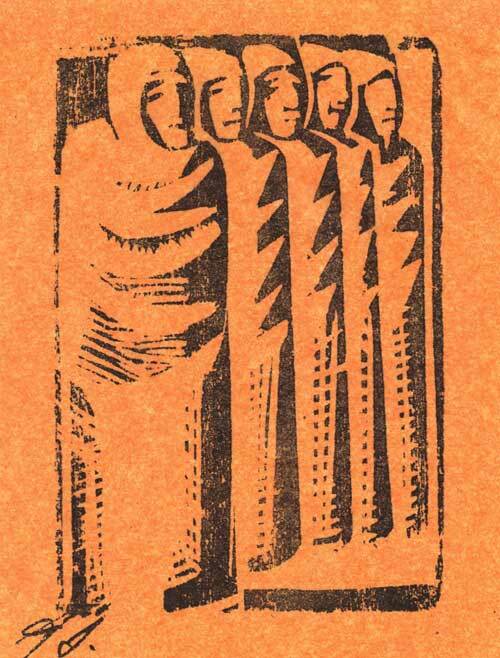 That said, these wood block prints by Siqueiros caught my eye. He called them "grabados," which my Spanish dictionary translates as "engravings," but that must also be the same word for "woodcuts." 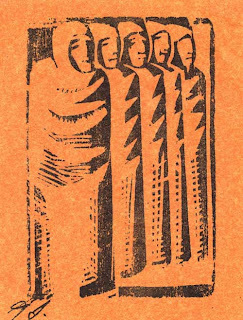 In any case, these thirteen wood block prints were apparently carved in 1930 while Siqueiros was in prison. They were published as a book in 1931, with originals in black ink on orange tissue paper pasted into the pages. I don't know what Siqueiros had to say about the theme of the set. They're clearly representing his recurring theme of workers and oppression. They emerged, like all his art, from his political convictions, but some of them have a visual impact that seems more universal. have shown so well. I think of the first one as a mother and child, but its title, "The Family," gives it a slightly different feel - these two are complete in themselves. There's both a beauty in that, and a question mark. I see the second as wise women - but that's just me. It turns out that its title is "At the Pawn Brokers," so presumably these people represent the nameless desperate poor. But perhaps Siqueiros meant for us to see them as both desperate and yet still possessed of wisdom and dignity. In any case, in both these blocks I like the straight, stiff postures, the enveloping shawls, and the blocks of shadow. You can see all thirteen woodcuts in the series here at Jose Vera Fine Art & Antiques. My new book is out! Kate and Sam and the Cheesemonster is the final installment in the Kate and Sam Adventure trilogy, and it's been a long time coming for such a little book. My own Kate and Sam adventure began three and a half years ago, when I asked P and T (then just turned 6) if they'd like me to write a book for them. They enthusiastically began offering suggestions for what the book should include, and when it was written they helped me illustrate the story. When it was finished they loved Kate and Sam to the Rescue, obviously, and requested a sequel. I began work on Kate and Sam and the Chipmunks of Doom. Meanwhile, proud P and T had shared the first book at school, and in the spring I was invited to visit their classes to talk about it. T's teacher read Kate and Sam to the Rescue to the whole class as a read-aloud, and it went over very well with the first graders. They all asked whether I would write any more books. I told them I was working on Chipmunks of Doom, but I also happened to mention, just as a throwaway line, that T, P, and I had joked about the title Kate and Sam and the Cheesemonster. (We sometimes said our cat Nightshade was a cheese monster, because cheese was the only people food she ever wanted, but she wanted it really badly…) After my classroom visit I got a whole sheaf of adorable letters and pictures from all the first graders, and to my astonishment, quite a few of the letters urged me enthusiastically to write about a cheese monster. So, after the second book was finished I dutifully tried to come up with a cheese monster plot. I had a few ideas, and I got D to help me work out some more. But I soon stalled out. 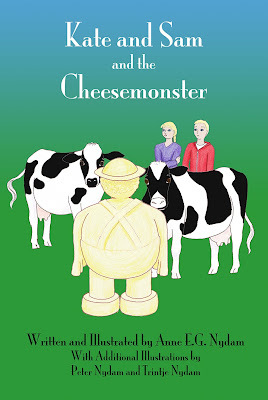 Kate and Sam and the Cheesemonster was not a book I was enjoying working on. I didn't really want to write it… So the Cheesemonster languished while I wrote Ruin of Ancient Powers instead. But all that time, whenever I showed my face at school to run a table at the art festival, to volunteer at the library, to attend a concert, one of those kids was always sure to ask me whether I was working on Kate and Sam and the Cheesemonster yet. I began to feel (if I can be so pretentious) like Conan Doyle with Holmes! But this bunch of kids at P and T's school have been Kate and Sam's most loyal fans, and they deserved that I make an effort. Last spring I sat down with the Cheesemonster once again. And finally something began to come together. Indeed, I even began to be excited about it. It stopped being a chore and started being a story to be told. And so the Kate and Sam trilogy was finally finished, and illustrated with the help of T and P, and the copy to be donated to the school library is sitting ready to go. Oh, I'm definitely finished with the series now - P and T and their classmates will soon outgrow it, and I'm ready for other things, too. But I've gratefully dedicated this book to those students and their belief in me as an author! 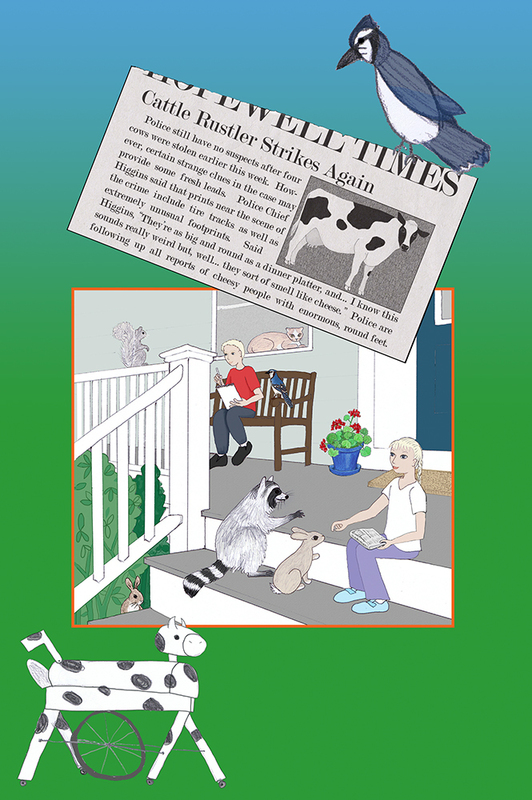 When the cows are stolen from a nearby farm, Sam and Kate think it’s a job for the police… until they realize that solving this strange crime will require help from the neighborhood birds and beasts. That means it’s another adventure for Kate and Sam, the only humans who can speak animal language and know the secret of the magical creatures. are there anyway? And most mysterious of all, what kind of monster is leaving huge, round footprints that smell like cheese? 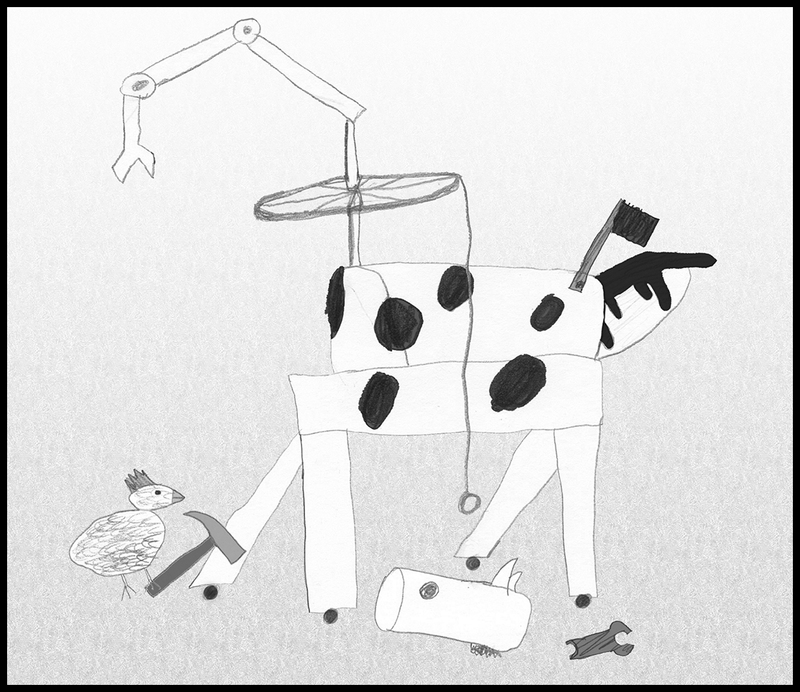 It’s a good thing Kate and Sam get help from animals large and small as they struggle to solve these puzzles and rescue all the prisoners of the Cheesemonster. 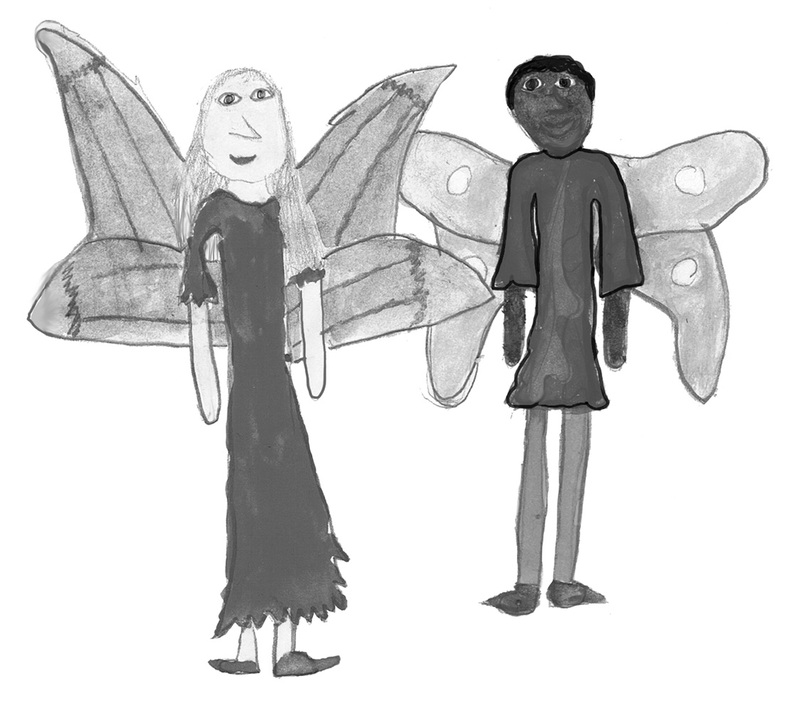 There will be beetles and robots, dragons and fairies, monsters and clues and disguises. But never fear! Through darkest night and deepest swamp Sam, Kate, and their friends old and new will use all their creativity, courage, and common sense to save the day once again. The third adventure in the Kate and Sam trilogy joins the others as a perfect read-aloud to be enjoyed with children of many ages. Emphasizing the power of kindness, creativity and courage, these books are gentle enough for pre-schoolers at bedtime, but complex, humorous, and engaging enough not only for older elementary children, but even for adults reading to them. I wanted to do today's post on the oldest known block prints, since relief printing is such an ancient process. 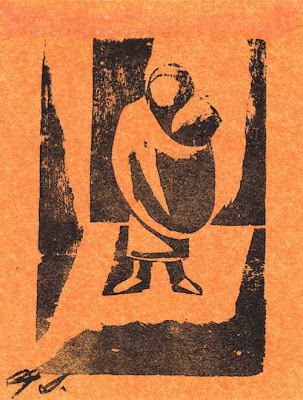 But "the oldest block print" is actually not such a simple idea. First of all, a lot depends on what you define as block printing. For example, the cylinder seals of Sumeria date back to 3500 BCE and were created in much the same way as a relief printing block. A design was carved into stone so that when the stone was pressed into clay the design would be transferred, as many times as you cared to repeat, and of course in reverse. But I think you need ink to qualify as printing, so I'm not counting seals. On the other hand, some people think you have to print on paper to qualify, and many even want to start the "history of printing" with the earliest printed books. 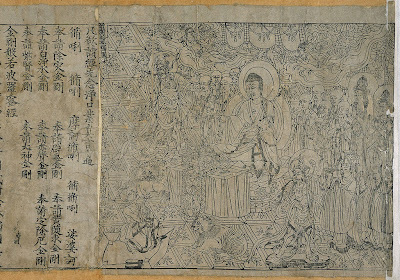 The "Diamond Sutra" is often cited as the earliest printed book (a scroll, actually), dating from 868 in China, but it's technically the oldest dated printed book we've found. 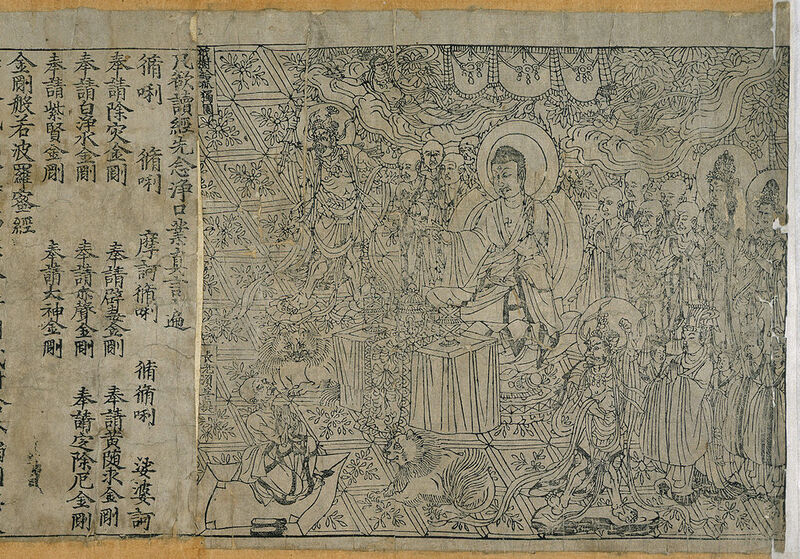 “The oldest extant woodblock printed text on paper in East Asia is the Dharani sutra discovered in the Seokka-tap (Shakyamuni pagoda) in 1966 in Bulguk-sa Monastery in Gyeongju. Since this pagoda was completed in 751, the printed sutra placed within has the terminal date of 751.” In any case, however, I think the paper/book definition is too narrow. that could have been going on for centuries before the date of any surviving fragments. Evidence of early printed fabrics has to come from pictures of people wearing patterned clothing that looks as if it might have been printed. But of course no one knows for sure what process might have been used for these patterns. 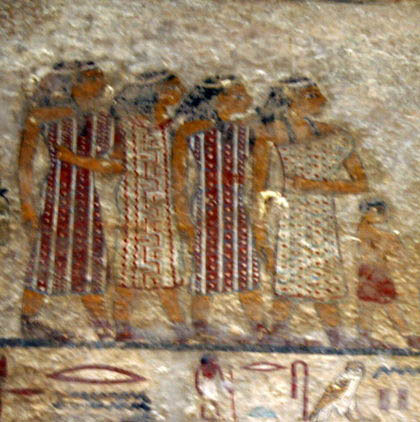 One example comes from murals in an Egyptian tomb at Beni Hasan, dating to about 1980BCE. Although ancient relief printing was used and viewed in a very different way from modern artists' printmaking, it's still cool to try to see where it all began. Nomadic traders in patterned clothes, detail from painted mural in the tomb of Khnumhotep II, Beni Hasan, Egypt, c.1980 BCE. Quotation from: Kim, Kumja Paik, Goryeo Dynasty: Korea’s Age of Enlightenment, 918–1392. San Francisco: Asian Art Museum, 2003.